It was love at first sight...BAM! On browsing Facebook a few weeks I was completely taken aback by the most beautiful sight. Rosetta was her name, she flaunted as many red roses as a sleazy Lothario on Valentine's Day. She flirtily enticed me to take a closer look and I was hooked. 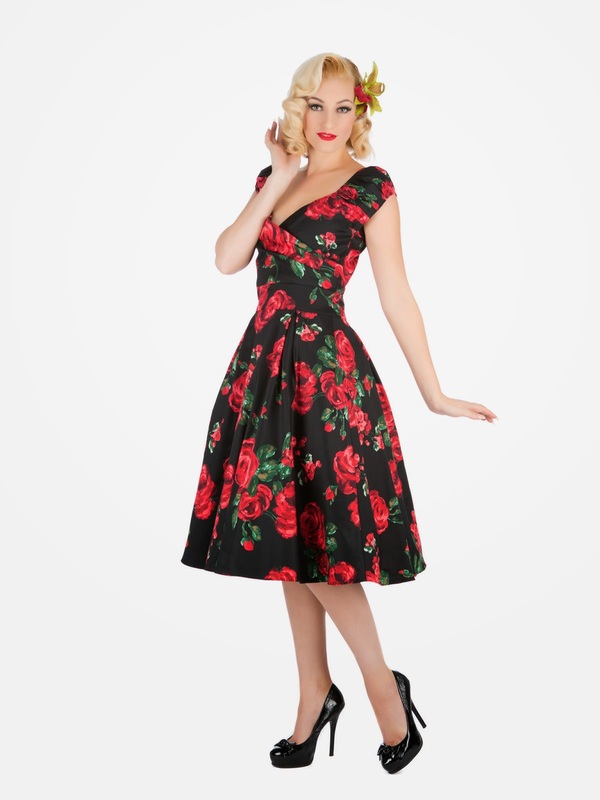 I'd ordered my usual Lady V London size in the Rose Print Rosetta Swing Dress which is a UK 8. The size chart puts me at a 10 bust, 8 waist and 12 hips but I'd recommend working from your waist measurement if your figure is anything like mine. To ease the awkward 'which size do I order?' dilemma of the Rosetta Swing, you only need to take into account your bust and waist measurements since it's free at the hips. 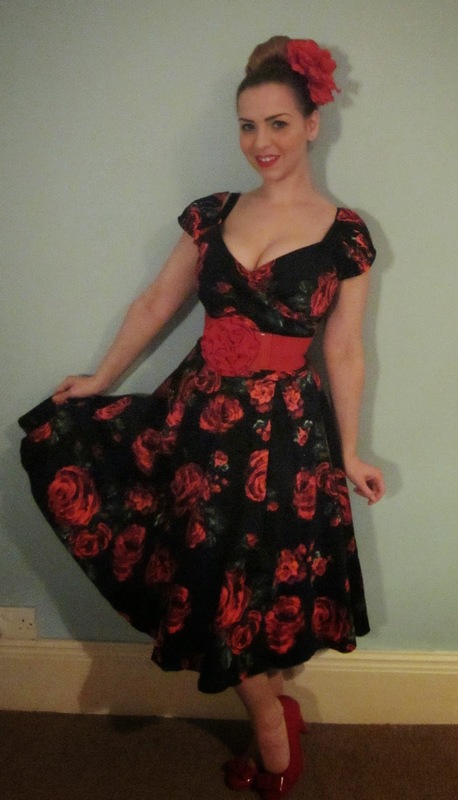 The Rosetta Swing Dress size chart below suggests a UK size 8 to be 33" bust and 27" hips. I'm currently sitting at 36" bust and 25.5" waist and the Rosetta fits fine, possibly because of the mock wrap bust line giving a bit more flexibility on size. 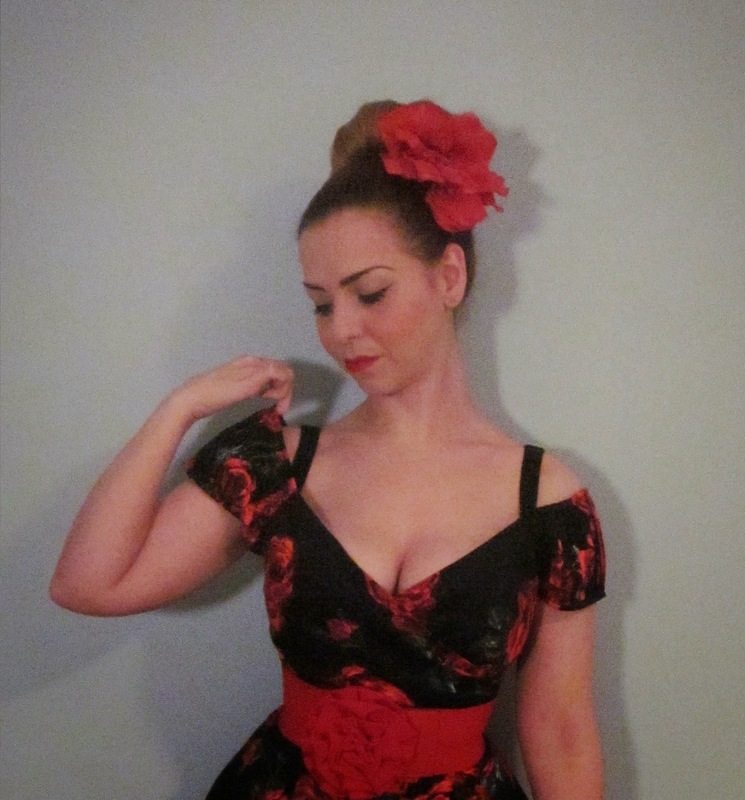 The Rosetta Swing Dress sits a few inches below my knee. I'm 5'2" for reference. Now as you may have gathered from the title of this post, this love story does not end well. It's visible on the middle photo above that one of the sleeves is slipping and that's with me posing in an attempt to prevent that happening. As I've discussed a number of times before, I often have issues with the fit of dresses and tops at the shoulders since I'm quite petite, causing straps to slip, gaping collars and a generally awkward fit. Rosetta, my love, this is where it all went wrong. As you can see in the photo above, I'm not posing to make it look any worse, this is genuinely how much bigger than my shoulders the dress is. Sadly, the sleeves can't be altered easily as they are pleated and it would be quite a difficult job to do neatly so I'm told. This was the deal breaker for me. It's okay to have a bit of extra wiggle room in the waist, not quite enough in the bust, but the shoulders slipping, nope. I feel I need to throw in a disclaimer here that the dress itself is absolutely stunning and I would have kept it in a heartbeat, but my petite shoulders let me down here, not the dress. If you're of a more standard build around the shoulder area then you'll more than likely find it will fit. Damn shoulders! Rosetta is available from Lady V London for£60 in 7 different colours, sizes 8-20/22. As an aside, if you love this dress but prefer a more streamlined silhouette, check out Loretta which has the same top half with a mock wrap tulip skirt. Alas, I bid farewell to Rosetta. Please join me and my wardrobe in mourning this sad loss. 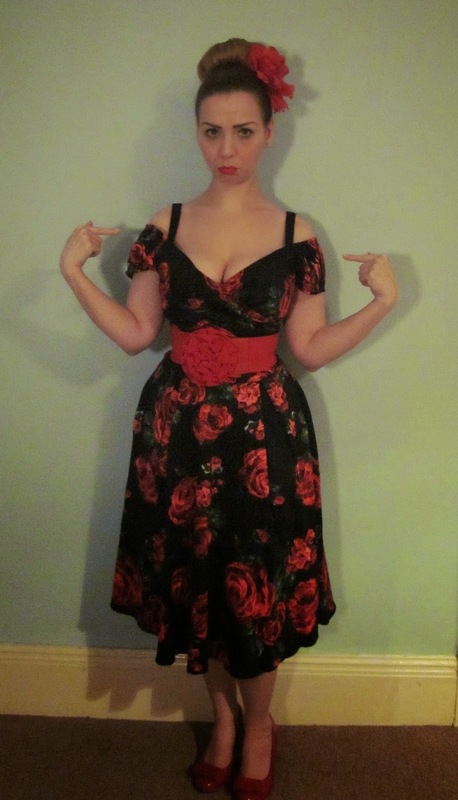 That Lady V London red and green rose print Rosetta Swing Dress looks gorgeous on you worn both on and off-shoulder. (was it Madonna who made having bra straps showing fashionable?) Pretty dress - I hope you some equally beautiful dresses and complementary lingerie find their way to your wardrobe. Bitter Lollipop tastes good to me!